This set of Engineering Geology Questions and Answers for Entrance exams focuses on “Composition and Texture of Igneous Rocks – 02”. Explanation: Orthophyric texture is another type of equigranular texture, which is in between the granitic and felsitic textures. The individual grains are fine in size but not microgranular. 2. What is the texture called when large-sized crystals are embedded in fine grained matrix? Explanation: The porphyritic texture is characterized by the presence of a few conspicuously large sized crystals (the phenocrysts) which are embedded in a fine-grained ground mass or matrix. Explanation: Porphyritic texture may be caused by any one or more of the following factors: Difference in molecular concentration, change in physic-chemical conditions and relative insolubility. 4. What is the absolute reverse of porphyritic texture? Explanation: Poikilitic texture is characterized with the presence of fine-grained crystals within the body of large sized crystals. In other words, it is just the reverse of the porphyritic textures. 5. What is the term when augite has inclusions of plagioclase felspar? Explanation: When the host mineral is identified as augite and the inclusions are of plagioclase felspars, the poiklitic texture is further distinguished as ophitic. 6. State true or false. The development of ophitic texture is completely understood. Explanation: The development of ophitic texture in rocks is yet incompletely understood. It may be due to operation of factors for porphyritic texture but in a different manner. 7. Which texture indicates flow of magma during its formation? Explanation: Those textures that indicate the result of flow of magma during the formation of rocks are known as directive textures. Explanation: Trachytic and Trachytoid textures are common examples of directive textures. The former is characteristic of certain felspar lavas and is recognised by a parallel arrangement of felspar; the latter is found in some syenites. Explanation: In certain igneous rocks crystals formed at earlier stages may get so arranged that polygonal or trigonal spaces are left in between them. These spaces get filled subsequently during the process of rock formation by crystalline or glassy masses of other minerals. 10. What is it called when two or more minerals crystallize simultaneously in a limited space? Explanation: During the formation of the igneous rocks, sometimes two or more minerals may crystallize out simultaneously in a limited space so that the resulting crystals are mixed up or intergrown. This type of mutual arrangement is expressed by the term intergrowth texture. 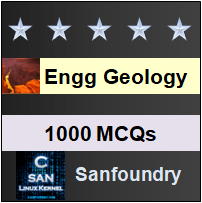 To practice all areas of Engineering Geology for Entrance exams, here is complete set of 1000+ Multiple Choice Questions and Answers.